Menopause marks the end of a woman's reproductive period and involves certain changes that she goes through before it sets in. Most women put on weight in their pre and post menopause period. These causes of weight gain may include hormonal changes, genetic factors or may be age- related conditions that result from lifestyle changes. With age, muscle mass diminishes while fat composition increases. Therefore, there is a decrease in the rate at which the calories are used by the body (metabolic rate). This results in a notable change in weight. Other factors like stress due to separation from children, divorce, death of spouse etc might change your diet as well as physical activity leading to weight gain. 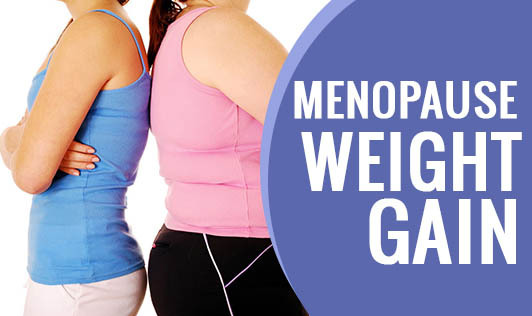 An increase in weight during menopause may increase the risk of type 2 diabetes, cardiovascular diseases and breast cancer. How to manage your weight? • Be more active. Make sure you go for a walk or jog regularly. Strength training may help you gain muscle thereby increasing the number of calories burnt. • Eat less. Make sure you eat a few calories less than normal. Have a well balanced diet by eliminating junk and fatty foods. • Find yourself a group of friends of the same age so you are motivated to make the extra effort of following a routine of a balanced diet, timely meals and regular exercise. Weight gain at any stage of life is harmful. Make an extra effort to make permanent changes in your lifestyle and diet. A simple and easy form of exercise is brisk walking. You can try your hand with yoga. Make healthy food swaps and enjoy the benefits.